My Biafran Story .org website is a collection of eye witness accounts of the Nigerian-Biafran civil war. The place and importance of the Biafran Airlift in the history of Sao Tome and, by extension, Portugal, cannot be over written. For almost three years that the war lasted, this small island located in the Gulf of Guinea saw the influx of individuals from all over the world. Journalists, diplomats, aid workers, missionaries, clergy men, politicians, doctors, military personnel, mercenaries, business men and all sorts of people arrived the island on their way to and from Biafra. Consequently, hotels and guest houses, restaurants, shops and markets, beaches and other leisure spots, the aviation industry, etc, all benefited, in one way or the other, from the upsurge in commercial activity on the island. The governor of Sao Tome even tried to cash in on the windfall by imposing a fee for every child that was brought from Biafra into Sao Tome. But Father Tony Byrne, one of the initiators of the Air lift, resisted the move. Silas and I are looking for any of these ‘children’ because we think our projects will not be complete without their participation. We will appreciate any leads and references in this regard. Barry and Larry often worked as a team, and Leo and I as a team. On a night that Barry and Larry were flying, Leo and I were drinking with the ARCO mechanics. There was Arnie the Swede, Helmut the Dane, Smyth the Englishman, Ben the Israeli, and three or four other Europeans. They complained about being overworked, that it was too much for the handful of them to keep those old planes flying. Leo and I said that we could turn a wrench, and we would be glad to help them if they showed us what to do. Chi nyere m aka - God gave me hands. And I can use them. The next day ARCO hired us as help mechanics, and the Portuguese airport authorities issued us flight line IDs as Ajudante de Mecanico. And so we became more formally connected with the airlift, not just nebulous Field Service Officers. We began our career as mechanics by removing parts from the damaged DC-7, noting carefully how we did it. Then we would ride into Biafra with the first flight, and work all night removing the same parts from another DC-7, which was down at Uli, and then come out with the last flight. The downed plane had had mechanical trouble and couldn’t take off. The next day the MiGs shot it up. The right wing and the fuselage burned; remarkably the left wing was still intact, with fuel still left in the wing tanks. There was a night at Uli when a late fog rolled in. I could hear a plane cross overhead and circle around, waiting for an opportunity to set down. It never came, and the plane returned to Sao Tome. That was my ride back. In a way I was glad, because I got to spend a day in Biafra. The sky turned slowly from black to grey as the morning light filtered through the fog. Reverend Aitken appeared. I didn’t see my old school, Ohuhu Community Grammar School, because the road to Amaogwugwu was not on our way. I did see a convent school where another PCV, Nancy Amadei, had been stationed. I saw women on the side selling food from enamel pans. I saw garri, peppers, and vegetables. I saw one woman frying yam chips in palm oil over a charcoal fire. I saw chickens, which surprised me – I thought they’d be all gone by then. This was the heart of Biafra, but I saw no begging. On an afternoon when I had just finished loading a plane, and the engines were started, Father Byrne came to me with a large package. He ordered me to stop the plane and put the package on board. I objected that the plane was already buttoned up and on its way. We could put it on the next plane. He said that the package was very important and must go on that flight. I ran around in front of the plane waving to the pilot. I pointed to the package, and he stopped taxiing. Helmut helped me put it in the forward cargo hold. When we backed away and the plane moved on, I said to him, “Do you know what is in that package?” He didn’t. It was sanitary napkins for the Nuns. We washed a DC-7 one day. It took all day and a lot of soap and water. I was soaking wet, but that wasn’t so bad for a hot day on the equator. The point of cleaning a plane was to reduce the skin friction, making it faster and more fuel efficient. As we did every evening when we weren’t flying, we watched the planes take off, and later watched as they returned. The plane we washed didn’t return. We waited and watched and turned to the tower for news, but there was nothing. It was gone. I had the terrible feeling that we had done something wrong when we washed the plane and caused it to crash. The investigation later determined that it had hit an iroko tree on approach to Uli in the dark. The plane disintegrated. There was a church near one end of the runway at Uli. The crew of our plane and others that went down during the airlift were buried in the churchyard. I heard that after the war Nigeria bulldozed the airstrip to eliminate the memory of it. And they bulldozed the graves. In spite of the bombing, the mechanical challenges, and the hazardous navigation, the planes kept flying, most of the time. At the height of the airlift, during the time I was there, we had up to 44 arrivals a night at Uli, which made it one of the busiest airports in Africa. But there were two times that I remember when the air crews refused to fly, and the airlift stopped for a few days. On one occasion a rumor spread that the Nigerian MiGs would begin flying at night to shoot our planes down. Caritas and WCC pleaded with the crews to fly, and eventually they did. Another rumor stopped the airlift a second time. One night the news spread that France had recognized Biafra. In jubilation Biafran soldiers fired their guns in the air. Some of the bullets struck a plane coming in at Uli. There was no serious damage, but the crews stopped flying again until the WCC and Caritas petitioned Biafra to enforce firing discipline. Evacuated children were taken to a convent called San Antonio. After a week they could sit up, and they could feed themselves. I went to see them. As I came into the compound, about a dozen of them ran to my side. A Nun told me a story about one of the children. He led a protest against a particular spread the kids didn’t like on their bread. At his signal all the children put down their bread and stopped eating. Some of the very young ones were reluctant to do this, but they went along. They won, and they were not served peanut butter again. You never win, if you give up when things are easy. Someone said that the airlift prolonged Biafra’s agony by bringing false hope. Without food for their people the leaders would have given up sooner. It sounds like a bad idea whose time had come, an idea that someone put forward and many others adopted without thought, a piece of facile wisdom. It makes sense if you don’t stop to think about. In fact, if you accept the idea, you can stop thinking altogether – no need to consider the complexities. The idea can be accepted by people with no personal, immediate concept of large scale random killing. They have not seen gangs running through their neighborhoods, dragging people out on the street and chopping them up. Biafran people saw the trains full of refugees pouring in from all over Nigeria. They accepted those refugees into their homes and villages. And they heard their personal, immediate stories. Another dimension, beyond security, for continuing the fight, is the concept of freedom to control one’s own destiny – not just to avoid disaster, but to build a positive future. In the shrinking Biafran enclave was the highest concentration of Ph.D.s in all of Africa. The motivation to learn and to grow into a modern society kept Biafra going. On my final trip to Biafra I was arrested as a Nigerian spy. Throughout the interrogation I remained respectful. I answered everything honestly, so when they tried to trip me up, I could always come back to what was true. I was not confrontational; I was not indignant. After the interrogation I was led to a small room, my cell, furnished with a simple couch and some chairs. Reverend Aitken showed up. He brought me a bag with some fresh clothes, magazines, a sandwich, and a couple of bottles of warm beer. The look on his face was disappointment, not sympathy. I didn’t understand it then, but I may have caused the airlift a real problem. I was interrogated again. This time the commander told me that they weren’t sure what they were going to do with me. He said they were thinking of sending me to Umuahia, then the seat of the Biafran government. The head of the government was General Chukwuemeka Odumegwu Ojukwu. His 2IC was Dr. Michael I. Okpara, who had been the former Premier of the Eastern Region of Nigeria and the founder of Ohuhu Community Grammar School. I told the commander that I would be happy to go to Umuahia and perhaps meet Dr. Okpara again. I would learn later that they took spies and saboteurs to Umuahia to be shot. One of the young airport officials would sit with me and chat. I gave him some money and asked him to buy some kola nuts, oji, and palm wine, mmanya. We invited a few others and sat outside in the warm African evening. We broke the kola. “Onye wetara oji, wetara ndo - He who brings kola, brings life.” Someone there knew my name, because he knew one of my students from O.C.G.S who told him about me. I told them about the time I had helped Aitken carry some wounded people from the village to the hospital. I asked if anyone knew how they were. None did, but later someone inquired and reported that the boy and the young woman were recovering well. I was called before the commander. He said, “David, I am ordering you deported from Biafra. You must never return again.” As he said it, he was trying to sound very stern, but his demeanor was that of a father chastising an impetuous young man. I was escorted out to one of our relief planes. I helped unload it, and then I flew back to Sao Tome for the last time. Of the people who came together for the airlift, whatever they loved about fighting, whatever they loved about flying, whatever they loved about religion, whatever they loved about life, their paths crossed in a filigree of human motivational trajectories, called Biafra. Years later I gave a talk to a group of college students in Buffalo, New York. These were all students from the region formerly known as Biafra. I told them my stories and I showed them my pictures. I concluded with an observation. Many Americans believe that most relief aid never gets to those who need it, that it is diverted by corruption. One young man from the back of the room stood up. He said, “When we were children, we heard your planes going over at night. We never knew who you were, but we got the food. Every person in this room is alive today because of what you did.” Then they stood up and gave me a prolonged ovation. In October 2017, a random internet search about the Biafran Airlift led me to an article with the unusual title 'The World is Deep – Uwa Di Egwu.' It was written by David L. Koren, who was a Peace Corps Volunteer living and teaching in Umuahia, South East Nigeria, between 1964 and 1966. He left Nigeria just before the war broke out but in 1968, with the war in full bloom, he answered a call by the United Nations to work in Biafra as a United Nations Field Service Officer, a job which entailed organizing and flying relief material from Sao Tome into Biafra. His experiences, captured in 'The World is Deep,' is the first eye witness account about the airlift to be published in mybiafranstory.org. It can be found under the category THE BIAFRAN AIRLIFT. With his permission I have edited the article for brevity and broken it into two parts. David has also published a book ‘Far Away In The Skies,’ which is a more detailed account of his experiences working on that Airlift. It will be on sale in Nigeria in March 2018. Below is a preamble to the article. D.L.K.- I grew up in a working class family in Pittsburgh, Pennsylvania. Through hard work and living on the financial edge I became the first in my family to earn a university degree. Seeking to know more about the world, I joined the United States Peace Corps, and I was assigned to teach English at Ohuhu Community Grammar School in Amaogwugwu near Umuahia, before the war. I served there for three years, having the best time of my young life. For me, and for most Peace Corps Volunteers immersed in a different culture, we learned as much as we taught. Nigeria became my second home, with a new family. So, in 1968 when UNICEF asked me to return to work on the Biafran Airlift, I made the easy choice and volunteered again. Afterwards, I followed a career as a counselor in a mental institution. For a second career, I went back to school to study physics and astronomy, then worked designing optical lenses for industrial lasers. Now I keep busy on my six acre mini farm with my wife and two tractors. V.O.- In a nutshell, what are your views about war, crisis and displacement? D.L.K.- People gain more through diversity and synergy than brutal warfare. V.O.- What are your fondest memories from living in Ohuhu? Any names of families, friends or colleagues you would like to mention? D.L.K.- I have fond memories of my student librarians: Matthew Nwuba, Onyema Obilo, and Patience Igweonu; also our senior prefect, Okon Nkanta Abijah; and our principle, Wilber O. Nsofor. I still have my grade book from 1964, 65, and 66, with all the student names, and at the end of my book, Far Away in the Sky, I published all their names. At a convention of the Ohuhu Union in Houston, Texas, last May, I met some of them and asked them to sign my grade book next to their names. What an emotional high. V.O.- You said, “...we learned as much as we taught?” What were the most important things you learned about the Igbo society at the time? D.L.K.- I learned the friendliness of the Igbo people and their warm acceptance of strangers like ourselves, the strength of family ties, the desire to learn and the skill to apply their knowledge. I learned about Igbo philosophy through slogans and proverbs: profound expressions such as "The World is Deep," "Life is the Main Thing," "God Gave Me Hands," (also "God gives me a hand in my need"), as well as the patience, perseverance, and acceptance implied by "Who knows tomorrow?" Most importantly, the assurance of protection and safety in the kola ceremony. Even after 50 years, I still feel comfortable in Igbo company. V.O.- Was it your experience in the Nigeria-Biafra war that qualified you to be a counsellor in a mental institution afterwards? D.L.K.- After I returned form Biafra, I earned a master's degree in Rehabilitation Counselling and I scored very highly in a state-wide entrance exam for the position. But no doubt my experience in the war strengthened an attitude in me of acceptance for people in need through no fault of their own. Mentally ill people especially need reassurance that in spite of their disability, they are people of worth. D.L.K.- Yes. I should have written: Uwa di egwu, Ndubuisi, Chinyere m aka, and Onye ma echi. The first time I went to Africa the sun was rising over an endless stretch of palm trees as the Pan Am Boeing 707 banked steeply on approach to Lagos, Nigeria, January 1st 1964. The second time I went to Africa, two years later, the captain of the green and white painted Nigeria Airways/Pan Am 707 announced that we were denied permission to land at Lagos, because there had just been a military coup. We circled for some time before we were cleared to land. Soldiers with guns watched us disembark. I was supposed to make a connecting flight to Enugu, capital of the Eastern Region, where I had been stationed for the last two years as an American Peace Corps Volunteer. I was just returning from home leave. Nobody knew what was happening. Arriving passengers were escorted to the Catering Rest House, where we were to put up for the time being. Later, I went to bed, in a small room, in a distant land, unable to adumbrate any sense of future. The next day a flight was arranged to the Eastern Region. We landed at Port Harcourt with no problems. The airline arranged for a small bus to transport passengers to Enugu. I got off in Umuahia and took a bush taxi - a Morris Minor - to my school, Ohuhu Community Grammar School in the village of Amaogwugwu. The school was started by Dr. Michael I. Okpara, a prominent man from the village, and also the Premier of the Eastern Region of Nigeria. News began to unfold of what happened with the coup. Peace Corps Volunteers got news from the local newspaper and from what we called time-n-newsweek. The international editions of Time and Newsweek were available in Umuahia, and we bought both of them from the news boys, onye akwukwo. After six months another coup ousted all the Igbos (Ironsi was shot, Gowon was installed), leading to the massacre of Igbo civilians in the North and a mass exodus of refugees back into the Eastern Region. Trains arrived from the sabon garis of the North carrying refugees; on one there was a headless body. All of these people were absorbed into their villages of origin. New huts were constructed and donations of food and clothing were requested. We all contributed. Although this was a great burden on the local population, it was effective in caring for the refugees. And therefore there were no refugee camps with deplorable conditions to catch the attention of the world media. Dr. Okpara hosted a send-off celebration for me and my fellow PCV, Ric Holt. He conferred on us the honorary title of Bende Warrior Chieftain, along with the appropriate garments – a wrapper and jumper of fine cloth and a woven cap. I stood up in my new clothes to give thanks. Dr. Okpara and the other dignitaries and guests seemed amused. At this time the commercial planes were still flying between the regions, and I left Nigeria with the memory of soldiers at airports. The third time I went to Africa, October 1968, I flew in an old DC-6 propeller plane from Amsterdam to Tripoli to Ivory Coast to Sao Tome, bringing relief supplies for Biafra. I joined three other former PCVs on Sao Tome; we were to act as cargo masters on the relief flights. We were officially known as United Nations Field Service Officers, and we were kept busy while waiting for clearance to enter Biafra. Food donations came to Sao Tome by air and sea and were delivered to thirteen different warehouses around town. As each shipment arrived it was dumped in a warehouse with no organization, no inventory. Preparing a plane load of relief supplies was difficult, because no one knew what food was available and what condition it was in. The four of us Field Service Officers worked with Sao Tomeans and a Danish relief organization to organize the warehouse. The relief effort on Sao Tome was put together by a group of Northern European churches, Nordchurchaid, representing the Protestant World Council of Churches and Catholic Caritas International. This was distinct from the International Committee of the Red Cross – ICRC - which operated from the island of Fernando Po. WCC and Caritas were established entities, but the airlift they put together for Biafra took form as it went along. They created a company called ARCO to buy and charter planes, while a German church group called Das Diakonische Werk was designated to provide flight operations. The United Nations contributed a handful of Field Service Officers. These donations were well meant, but inefficient. A DC-7 carrying 10 tons of canned goods would be carrying 7 tons of water and metal. A pharmaceutical company sent a shipment of sun tan lotion. It was said that they wrote it off as a charitable donation. Other medical donations were more appropriate. Things changed when we began receiving 50 pound bags of dried food and powdered milk. The food was called CSM, for a mixture of corn meal, soy beans, and milk. There was a similar mixture called Formula II. By the time I began flying into Biafra we were carrying those bags, bales of dried stock fish, medicines, fuel and batteries for the lorries used to distribute them. We flew at night to avoid the Nigerian MiGs. The Nigerians also had a night bomber that would drop its bombs when we were coming in for a landing. We took off from Sao Tome while it was still light and timed the flight to arrive over the coast just at dark. We could see the burn-off flames from the oil wells in the Niger River delta. From my seat near the back of the plane I could also see the bright traces of antiaircraft shells arcing up toward us from below. The planes flew without navigation lights, so the gunners had to track us by the sound of our engines. The pilots didn’t seem worried about this. When I mentioned it to Captain Delahunt – he had been a carrier pilot in WW II - he banked the big plane around to identify where the AA was coming from, so he could alert following pilots. The bombs didn’t fall at every landing, but often enough. Each day either WCC or Caritas would choose the cargo for the flights that night. The trucks would go to the warehouses, load, and return to the flight line. My job was to help supervise the loading, in terms of what went into each plane and the distribution of the cargo within each plane. All flights for the night would be either WCC or Caritas, alternating from night to night. WCC and Caritas had separate distribution networks in Biafra. The four of us UNICEF volunteers took turns flying into Biafra. We would go in with the first plane, help with the unloading, and come out with the last flight. Those who stayed in Sao Tome helped load the planes. My first landing in Biafra was uneventful, but emotional. The night air was fresh and tropical and familiar. It felt, in a sense, like coming home. My job was to supervise the young Biafran Airforce fatigue workers who were hustling to get the food out the door so the planes could escape the bombs and return to Sao Tome for another load. Sometimes I held the torch light and sometimes I joined in heaving the food onto the lorries. When the bombs started falling you could hear them screaming down. After some experience with this it became possible to tell by the Doppler shift and intensity of the scream whether a bomb was going away from you or coming toward you and about how much time you had before it got there. One night after I had unloaded the first plane and climbed into the second one, the bombs came. The air crew and the soldiers who had been gathering outside the plane went for the bunker. By the sound I knew that the bomb was coming my way, and I judged that I didn’t have time to climb down the ladder and get to shelter. There were sacks of CSM piled neatly on either side of a narrow isle in the center of the plane and I dove in there, hoping they might absorb some of the shrapnel. The blast shook the plane and deafened me, but we escaped damage. The next day on Sao Tome, I walked around the plane for a closer inspection. I found a few hits, one near a tire, but none more than nicks or scratches. Immediately after that bomb went off, a second one hit further down the runway. We kept unloading the second plane as the first plane, which I had come on, was preparing to take off. I heard the engines rev up, and I heard it roaring down the runway. But then it stopped all of a sudden. As soon as we finished unloading I ran down to see what was going on. I saw a Canadian relief plane sitting on the runway with its nose wheel yards away from a huge bomb crater. Captain Patterson and a WCC missionary, Reverend William Aitken, were examining the hole. Reverend Aitken had heard the explosion and thought it was near the runway. He found the hole and also saw the aircraft starting its run toward him. From the edge of the crater he ran straight at the accelerating plane waving his arms frantically with a flashlight in each hand. The pilot told me that the flashlights were very faint from his perspective in the cockpit, but he could tell that there was something on the runway, so he throttled back and stood up on his brakes. He blew a tire but didn’t hit the crater or Rev. Aitken. The plane maneuvered around the crater and took off. There was enough runway left for it to get airborne. I only had a few contacts with Reverend Aitken, but they were significant. After the plane took off he asked me to come with him, and we went to find the flight line officer. We found him in the dark, and we all drove to a house near the airfield. The officer pounded on the door. “Wake up! Wake up! You’re holding up the Nation.” The man emerged tying his wrapper. He was in charge of airport maintenance. We drove him to his bulldozer, and he filled the crater. Tomorrow he would pave it, but tonight planes could land and take off on it. Reverend Aitken was tall, slender, and earnest. He never said much, but he listened attentively. After a bomb fell beyond the end of the runway one night, he came out of the dark and said, “Come with me.” The bomb had fallen in a village compound. Five members of the same family had run out of their house seeking cover when the bomb hit. A boy of about 20 years was dead. Two children lay dead with ragged shrapnel wounds in their foreheads and bellies. A boy of about 6 was hit in the leg. His leg was twisted at an odd angle. His eyes were open, but he made no sound. A young woman was bleeding from several places. She was singing. The song was high, plaintive, haunting, and continuous. We put them in the station wagon and drove them to the hospital at Awo Amama. When we left them the woman was still singing. On Sao Tome the four of us UNICEF Volunteers - Larry, Barry, Leo, and I - met the others who had gathered for this airlift. Missionaries. Mercenaries. Air crew and mechanics. Portuguese. Biafrans. Diplomats. Journalists. Africans of Sao Tome. The mercenaries preferred the Hotel Salazar, the high ground. Most of them had little to say: they sat quietly and drank and watched. Johnny Correa, a Puerto Rican American from New York City, breezed in once in a while, always ebullient. Taffy Williams, gregarious for a clandestine fighter, boasted of their exploits. He told of Steiner leading a few Biafran fighters through enemy lines to blow up some planes in Enugu. He said that Biafrans were the best fighters in Africa. “With a company of men like that we could make it all the way to the Mediterranean, and no one could stop us.” I thought, why the Mediterranean? Why not Lagos? Or Port Harcourt? The four of us would sit at Costa’s and talk about the motivation of those who came to the airlift. Some people were there to make money. Many were there because they were compelled by their religion to help the poor and suffering in the name of God. Yet many of these, missionaries included, openly distained or detested Biafrans. It was an abstract duty and the objects of their charity were irrelevant. It did not occur to the four of us, not then, to consider why we were there. As an aviation job, the Biafran Airlift attracted a fraternity of fliers from all over the world. ARCO hired a DC-7 captain from Lapland who used to herd reindeer. Crews from Iceland were there flying off the equator. A few men had recently flown with the other big aviation job at the time, Air America in Vietnam, Laos and Cambodia. The CIA had conducted a food relief operation in Laos with Air America. But no one talked about that, much. PHOTO CREDIT - THE INTERNATIONAL COMMITTEE OF THE RED CROSS. CAPTION - DC4 CARRY 6.5 TONS OF MEDICINES AND VITAMINS TO BIAFRA; V-P-NG-E-00231. DATE TAKEN - 27TH MAY, 1968. The Biafran Airlift was the first and most massive civilian relief program in modern history. It flew 5,314 missions, lifting more than 60,000 tons of relief material and consequently saving an estimated I million lives. It started after Nigeria imposed a food blockade on Biafra, which ensured that food and medicines couldn’t come into the secessionist enclave. Food production gradually dwindled as locals abandoned homes and farms seeking safety. The catholic missionaries in charge of the parishes started reporting cases of massive starvation and death in their locations. At that time, the only planes allowed into Biafra were flown by Hank Wharton, a gun runner, who was flying in arms for the Biafran government. Father Tony Byrne, one of those Catholic priests, got permission from the Vatican to negotiate with Wharton to fly in relief materials for the starving populace. But the church was faced with the moral conflict of having guns and relief in the same planes. This meant that relief material could only be flown in when Mr. Wharton wasn’t flying in guns and ammunition. This, in turn, meant that relief material, which initially constituted a few boxes of medications bought with funds raised by Catholic missionaries, was often delayed. By this time news had started filtering out to the rest of the world about the crisis in Biafra. Western reporters, such as Frederic Forsyth, were going back with news and photos showing severely malnourished children and, for the first time, the disaster happening in Biafra was being shown on televisions around the world. This elicited shock and outrage from people and governments, and churches started mobilizing the media to appeal for help for the people of Biafra. A group of Danish churches, headed by Pastor Vigor Mollerup, also started mobilizing help to start an airline whose planes would fly relief into Biafra. He met with Father Tony Byrne on the island of Sao Tome and, in the summer of 1968, an alliance was formed between Catholic and Protestant churches. At this time, Port Harcourt had fallen and the Biafran government turned a road in Uli into an airport. But Wharton was still in charge and the churches were being accused of bringing in arms with aid. Worse, on one occasion, Wharton’s pilots didn’t fly for two weeks and this indirectly led to the death of 40,000 Biafran children. A timely solution to this problem came when Captain Gustaf Van Rosen, a Swedish Aristocrat and pilot, flew into Biafra and met with Odumegwu Ojukwu, a meeting which led to Ojukwu granting permission to the churches to land their own planes at Uli. Wharton’s monopoly on the airlift was finally broken and Joint Church Aid, fondly called Jesus Christ Airlines, started operations. The planes came from the United States, Canada and Scandinavia, and they flew more than 30 flights every night. Each one had two fishes, the oldest symbols of Christianity, painted on them. Some of the pilots were Axel Duch, a Danish-Canadian man who was the first to volunteer his services to the airlift; Phil Philip and Eddie Roocroft from Britain; Harald Snaeholm and Thosteinn “Tony” Jonsson from Iceland; and Gunnar Oestergaard from Denmark. Captain Gustaf Van Rosen was its first Chief of Flight Operations but he was soon replaced by Axel Duch. Despite the fact that relief planes are usually welcome into conflict zones, the planes of the JCA were considered illegal. They were shot at and bombed by the Nigerian Air Force every night, and when crew members died, they were buried in a grave at the end of the runway. But the rest kept flying, even mastering how to land, off load their cargo and take off in 20 minutes. 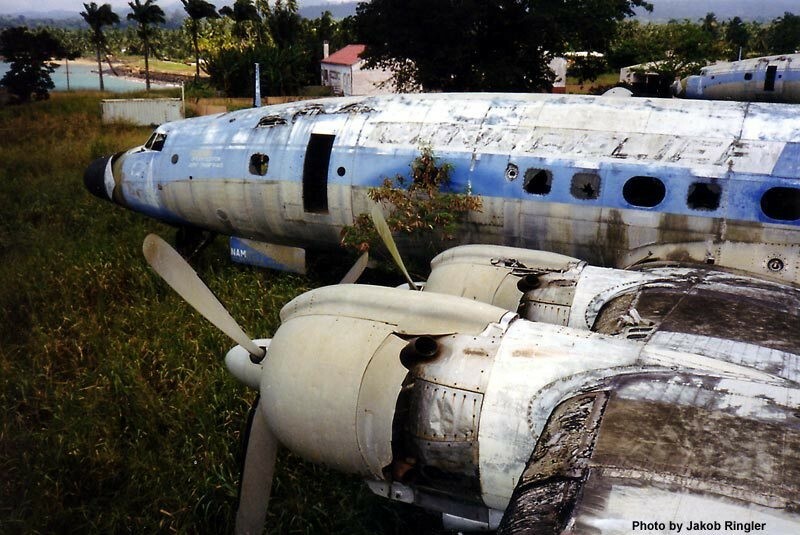 The planes didn’t always return empty to Sao Tome. Sometimes they carried precious cargo - babies and children in the worst and last stages of malnourishment and ill health. They were taken to San Antonio Orphanage on the island where they were nursed back to health. In May 1969, Van Rosen returned to Biafra with Swedish sports planes fitted with rockets. These Biafran Babies, as he called them, wrecked a lot of havoc on Nigerian planes. The reprisal attacks were brutal. The airlift became more dangerous and pilots started leaving. On January 12, 1970, a crew from Iceland flew the last mission into Biafra, to evacuate relief workers and priests. Its pilot was Thorstein “Tony” Jonsson. He had flown in and out of Bifara more than 400 times, more than any other pilot on the airlift. Today, the carcasses of those planes lie in a field on the island of Sao Tome - silent, metal monuments to compassion, bravery [dare-devilry if you will] and all that is noble in our shared humanity. On January 27, 2018, mybiafranstory.org will start a series - THE BIAFRAN AIRLIFT - to chronicle the stories of the men and women who took part in the airlift. NB- The Featured Image is taken from the internet. © 2019 My Biafran Story | All rights reserved.